I bet all of you will be standing in awe when you listen to this record for the first time - speaking from a personal experience here guys! 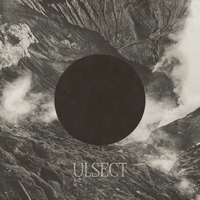 The debut, full-length, self-titled studio record by Tilburg, North Brabant, Netherlands-based group ULSECT has been officially released! Now, this is a group that I have followed from the very start, thanks to some friends who actually reminded me that some guys have created a new group based on DODECAHEDRON and ex-TEXTURES members, and that the sound might not be too unfamiliar to those who actually like those bands. Still, I must warn you that the band’s sound isn’t an easy thing to get into, but when you do, you are seriously going to need to start searching for your lost jaw. I’m a bit late with the review I admit, but the date when “Ulsect” came out was May 12th, so it still counts as a fresh release. Am I right? Get ready for a lot of dark touches in the sound, a lot of dissonance, a lot of technicality, progressiveness lot of brutal Avant-garde, Death Metal, and a slight touch of Black Metal. Eight songs to showcase the band’s sound are definitely not enough for you’ll see how brutal and malevolent it is, but trust me, once you get into it, you won’t be able to stop listening. “Fall to Depravity” opens up the album’s evil atmosphere. Everything feels so cold, and everything feels so dark. The vocals are incredibly brutal, a bit toned down, sometimes incredibly aggressive but sometimes incredibly low also. This almost seven-minute opus proves all what I have been talking about. I am amazed by everything, including the loud drums, the guitars, and the bass. I can hear everything perfectly - and one would think if such a band leans toward such a dark sound, what’s the point of a clean production? I don’t think I’m the one who should answer that, because I kind of don’t care, and I’m just shocked and really enjoyed the sound of the first song. There is so much dissonance, so many bizarre voices of creeping guitar tones, so much atmosphere - it’s like a bag of genres where you just randomly toss in your hand not knowing what you are going to get. So far, if you can’t keep up, I would recommend this band to fans of ULCERATE, DÉPARTE, GORGUTS, BLUT AUS NORD, TEXTURES, and of course, DODECAHEDRON. “Our Trivial Toil” isn’t much different than the previous track, except in length, and it’s here with almost eight minutes to blow you away, if you weren’t already by the previous song. Unlike the first, this song is slight more my favorite. I’d like to highlight how much I adore the vocals, they get deeper and deeper with every song, and the atmosphere is so malicious and so provoking, so indescribable, it is basically a hard task to describe something so evil even for myself. “Diminish” continues the Avant-garde game successfully, mixing a lot of nice guitar riffs and melodies with a brutal and overall beautifully-sounding atmosphere. I’m such a Season of Mist fan-boy, and I can’t help it, and neither do I wish to. My current goal is to be as precise as possible, to give this band new fans, to give the band a new hope in the scene, to find the right people that are actually as weird as me and enjoy such bizarre musical landscapes as the one that ULSECT creates. “Moirae”, the fourth song, is really short, but it’s still on point. As I suspected, this is an instrumental song. Many bands do such things nowadays, but I completely understand it and I’m not against the fact that such dark albums need a few instrumental opuses too; besides, this song creates such a groove bomb out of itself. “Unveil” is back at it again, where the previous tracks leaves off. Although the band doesn’t lack any atmosphere, it still gets heavier and heavier from song to song. “An Augury” is a bit of a slower track, and it caught my attention because it leans toward more experimental music, and toward a bit slower yet more technical sound. I might be wrong at times, but I’m just writing what I experienced whilst listening to it. Still, my final conclusion is that the sixth song is my absolute favorite. The penultimate track, “The Ending” continues with whirls of riffs, thunder-based drumming, and a lot of vocals that one can be experienced on previous songs. Still, I could hear that almost all focus was put toward this song - since it’s a song before the final and is a good four-minute intro to “Maunder”, which is the very last track on the album. When it comes to the last track, I am not surprised that it isn’t the fastest one, but why be it at all? This track is massive. It is heavy and incredibly strong, plus it’s so slow that it could be called a Sludge Metal song, with a slight touch of Avant-garde, Technical and Post Metal. Very enjoyable, and it’s a beautiful outro to everything you have heard.